We are just over a week away from arguably the most important conference on GST post-implementation. 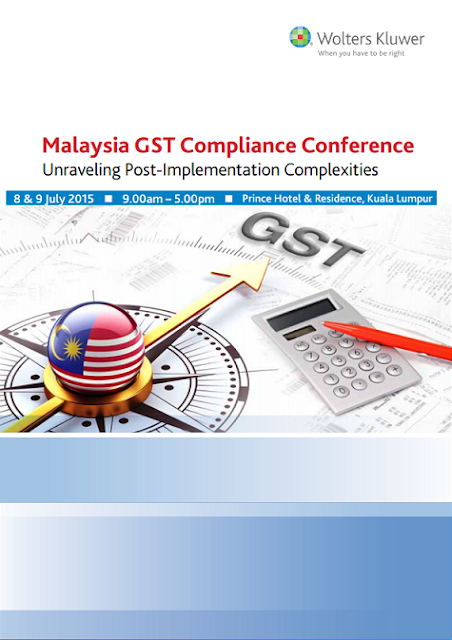 The Malaysia GST Compliance Conference, aptly subtitled Unraveling Post-Implementation Complexities is on the horizon! Three months into GST, your company is probably facing real life GST challenges that you may not have thought you'd encounter pre-implementation, with many grey areas and the need to understand the differences between theory and practice. New issues continue to turn up, but are you sure the way you're tackling them is the best way? Meanwhile, the Customs Department pushes on with its implementation of GST. The Anti-Profiteering Act is well in effect and companies need to ensure they steer clear. Join us on the 8th and 9th of July 2015 at Prince Hotel & Residence in Kuala Lumpur for valuable information-sharing and ensure you are up to date with the latest GST developments. Learn GST problem-solving strategies, know and understand key areas of concern and how to avoid costly mistakes. Find out what the latest DG decisions or public rulings mean for your company. And of course, don't miss the chance to network and share experiences with representatives from other businesses as well as leading experts in Malaysia GST. The Conference line up is like a Who's Who in the local GST industry, with representatives from all of the Big 4 accounting firms scheduled to appear, as well as other leading lights such as Thenesh Kanaa, S Saravana Kumar, Lorraine Parkin, Vijey R Mohana Krishnan, and of course, our Conference Chairman, Dr. Veerinderjeet Singh of TAXAND. Mr Bhupinder Singh of Petronas, the writer for our Malaysia GST Reporter Online, will also be there! Sign up now! Contact your regular Account Manager or download the registration form here.